Adventure Map Brazil  - $9.95 : Trail Explorers Outpost, Keeping the Adventure Alive! National Geographics Brazil AdventureMap is designed to meet the unique needs of adventure travelers detailed, durable, and accurate. 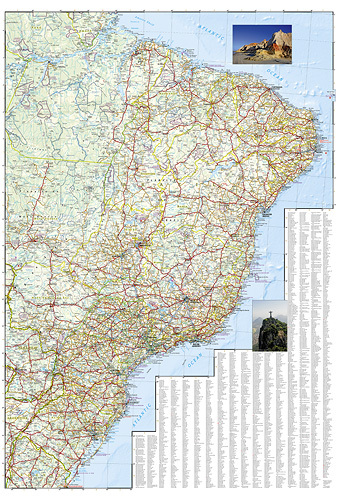 Brazil includes the locations of thousands of major cities and towns with an index for easily locating them, plus a clearly marked road network complete with distances and designations for major highways, limited access highways, tollways, and more. What sets National Geographic AdventureMaps apart from traditional road maps are the hundreds of points-of-interest that highlight the diverse, unique, and exotic destinations within Brazil including national parks and reserves, World Heritage sites, archeological sites, indigenous areas, churches, zoos, and museums. The front side of the Brazil map includes the western half of the country and features the remarkable Amazon Basin and the Mato Grosso Plateau. Airports, airfields, anchorages, and other travel aids are invaluable for adventurers seeking to explore the tropical rainforests, savannahs, and woodlands at the heart of the countrys interior. The eastern half of the country is covered on the back side of the map, including the capital of Brasilia and the cities of Sao Paulo, Rio de Janeiro, Salvador, Fortaleza, Curitiba, Porto Alegre, and more. Harbors, lighthouses, and cruise routes are noted along Brazils extensive Atlantic coastline. Our Brazil AdventureMap is printed in the U.S.A. on a durable synthetic paper, making it waterproof, tear-resistant, and trail tough capable of going anywhere you do. 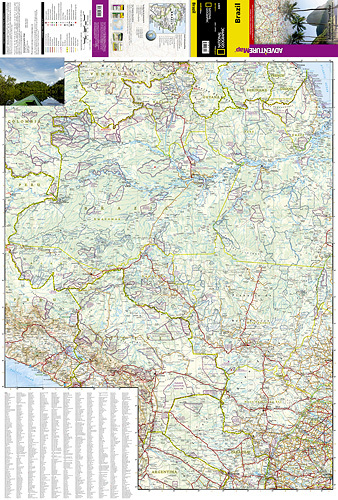 The map is two-sided, and can be folded to a packable size of (4.25 x 9.25), unfolded size is (26 x 38). Each National Geographic AdventureMap highlights the protected areas along with a legend detailing the types of boundaries included. Net proceeds from the sale of this map go to support the nonprofit mission of the National Geographic Society. Mysterious and breathtaking, Brazil is home to over half of the worlds remaining rainforests and some of the greatest biodiversity on the planet. It is both a nation of pristine wilderness inhabited by indigenous tribes and host to the colorful annual revelry of Carnival. Visitors can find relaxation and adventure in its tropical forests, waterfalls, and white-sand beaches, or enjoy the excitement and cosmopolitan bustle of Rio de Janeiro or Sao Paulo.